Defense Secretary Robert Gates said he will not have to cut troop levels further in Iraq to free up at least two of those three brigades for Afghan duty. 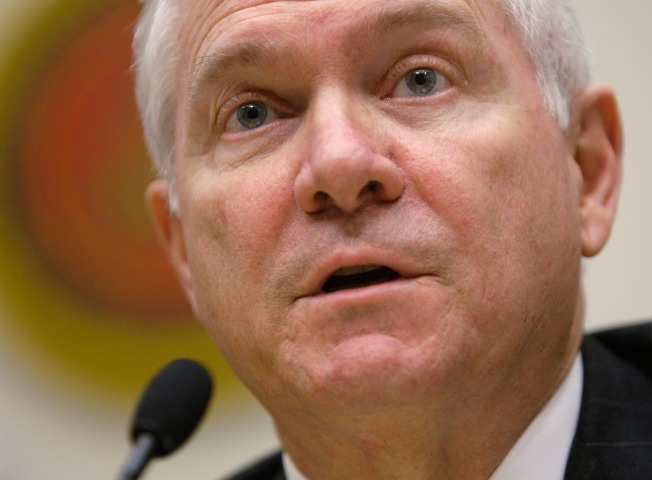 KANDAHAR, Afghanistan — The Pentagon is moving to get three of the four combat brigades requested by commanders into Afghanistan by summer, Defense Secretary Robert Gates said Wednesday as he traveled here to meet with military leaders. In his most specific comments to date about how soon he will meet the call for up to 20,000 more troops in Afghanistan, Gates said he will not have to cut troop levels further in Iraq to free up at least two of those three brigades for Afghan duty. At the same time, Gates said a key "course correction" in the Afghanistan war for the administration of President-elect Barack Obama will be to build the Afghan army and better cooperate with Kabul on security operations. "I think there's a concern on the part of some of the Afghans that we sort of tell them what we're going to do, instead of taking proposals to them and getting their input and then working out with them what we're going to do, so it's a real partnership," Gates told reporters traveling with him to Afghanistan. "That's an important aspect of this, that I think we need a course correction." Gates was scheduled to meet with Gen. David McKiernan, the commander of U.S. and NATO troops in Afghanistan, and to gather with U.S. troops in Kandahar. The meetings come as senior military leaders and the White House are pulling together a broad new military strategy for Afghanistan, one that would shift the focus from the waning fight in Iraq to the escalating Afghan fight. Gates said he expects the troop levels in Iraq to remain fairly steady through the provincial elections early next year and "probably for some period of time after that." While there is wide agreement that the military emphasis will now shift to Afghanistan, long regarded as the secondary priority behind Iraq, there is still debate on how best to do it. Gates would not detail any of the findings that have surfaced in the strategy reviews. But the push to increase the size of the Afghan army is reflected in at least one of the ongoing studies. The White House, the Joint Chiefs of Staff, the incoming Obama administration and Gen. David Petraeus, commander of U.S. Central Command, all are conducting their own reviews. Obama has said getting more troops to Afghanistan is a priority. Gates said he has no details on the expected deployments to Afghanistan next year, adding that he has not approved any orders for specific units. He said the Joint Chiefs may have identified the units, but he's not aware of those decisions. He added that he does not know when he will be able to send the fourth requested brigade. Gates and other U.S. officials have endorsed efforts to pour four combat brigades and thousands of support troops into Afghanistan to stem the spike in violence and tamp down the resurgence of the Taliban. Officials already had announced that one unit — the 3rd Brigade, 10th Mountain Division — would go to Afghanistan in January and that they would try to meet the rest of the troop requirements as soon as possible. But military leaders have resisted disclosing which units or how quickly they would go, saying much depends on how quickly troop levels can be cut in Iraq. A brigade is about 3,500 troops. The U.S. is working to meet deadlines in its agreement with Baghdad that require combat troops to leave the cities by June and be out of the country in three years. As planned, the number of combat brigades in Iraq is dropping to 14 early next year, and Gates said that level will enable him to get a second brigade to Afghanistan by summer. He said he's not sure whether the third brigade will be redirected to Afghanistan from a planned tour in Iraq or if it can be found elsewhere. Asked whether Marines may be tapped to go, Gates said the decision has not been made. The top Marine officer, Gen. James Conway, told The Associated Press this week that he believes there is a growing consensus that Marines could be used to fill part of the need in Afghanistan. If approved, he said, some could go there in early spring. "It's clear that the Marines want to be in the fight, that's what you'd expect," said Gates, adding that it's clear that the security situation has greatly improved in Iraq's Anbar province, where the bulk of the Marines are. "I don't have a problem with Gen. Conway's desire to have a bigger part of the mission in Afghanistan for the Marine Corps." He said he will wait for recommendations from his military leaders. There are 31,000 U.S. troops in Afghanistan, including 13,500 with the NATO-led coalition and 17,500 training Afghan troops and fighting the insurgency. There are 149,000 troops in Iraq. Gates' stop in Afghanistan was designed initially as a farewell tour to visit troops as he prepared to leave office. But that changed when he was asked to stay on by Obama, making Gates the new administration's Republican holdover in the Cabinet. During a NATO meeting in October, Gates asked allies to consider increasing troop levels in Afghanistan next year during the elections, a move that has been made for past votes, both there and in Iraq. Gates said the increase would be temporary, and it was not clear how many forces would be needed or who would provide them. At the same meeting, the allies also agreed on to step up their operations to combat Afghan drug lords who fuel terror networks.